Go Go’ers, we’re down to a couple days of ho, ho, ho and counting for Baby J’s birthday bash this Sunday. Here’s the problem. After Sunday, comes Monday and there you are with a passel of house guests clamoring to see the “real” L.A.
Or maybe that’s just you climbing the walls. Either/or, this bunch of Boxing Day forays is guaranteed to wipe Christmas from your memory and kickstart you toward NYE. You’ve been spitting out faux snow at temples of commerce all over town. Now come see a real winter wonderland, SoCal style. In May, Dan Koeppel leads a two-day, 40 mile hike from Downtown L.A. to the Hollywood Sign. His Boxing Day Epic hike won’t be quite as ambitious but your bootay will definitely feel like it’s on the way to NYE awesomeness. The all-day, post Xmas expedition starts at Fillmore Station – Metro Gold Line at 9:00 a.m. and ends at 4:00 p.m. at the Lincoln Heights Station – Metro Gold Line where finishers will ride the rails back to the starting point. In between stations, you’ll zip — well, maybe not zip — back and forth across the Arroyo Seco via twelve miles of “stairs, dirt paths, tunnels, and bridges”. So, basically, everything but a sidewalk, you urbanite you. If you’re already triangulating your “bail” options with convenient mid-day martini stops, immediately revise the above designation to “slacker urbanite. And please apprise Ms. Go Go of your itinerary. The ‘tini research never ends. Out-of-towners may think your glamorous L.A. life is year-round poolside lounging under palms, cutting-edge dance clubs filled with Other Beautiful People, and non-stop sushi rolls and Cranhattans. 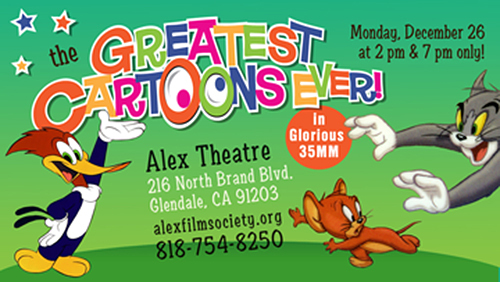 And while it is all that — and so much, much more — the real advantage of urban living is the opportunity to kick back and see your childhood cartoon faves on a bigger-than-a-flat-screen at the 2nd annual Cartoon Hall of Fame Big Screen Event at the Alex Theater in Glendale. Tinsel Town home advantage, baby. There’s an afternoon (2:00 p.m.) and an evening (7:00 p.m.) screening of the 35 mm, classic cartoons and all of the expected cinematic genre fare is represented: mutant children (the weirdly wonderful Gerald McBoing Boing, 1951); eerie tales of the supernatural (Lonesome Ghosts, Mickey, Donald and Goofy, 1937); and lush adventures in exotic lands (Popeye Meets Ali Baba, 1937). There’s also the esteemed literary classic: Dr. Jekyll & Mr. Mouse. (Tom & Jerry, 1947). You’ll probably want to bring that brainiac hottie you’ve been trying to impress. ‘Cause nothing says “intellectual” like Mr. Mouse. If you’re lucky, you know R Bar‘s Naomi Schimek and her deft hand with lush, garden-gladdened cocktails. This Monday, Schimek is hosting a Boxing Day Social — and really, what’s more social than drinking on Boxing Day? — at The Spare Room in the Hollywood Roosevelt Hotel. Here’s who else is fortunate — Downtown down-and-outers served by the Hospitality Kitchen (a.k.a. the Hippie Kitchen), a soup kitchen operated by Los Angeles Catholic Worker, which is benefiting from your suggested $10 at-the-door donation as well as funds raised via The First Annual Bartender with Bar Tabs Auction. That’s right, Go Go’ers. Kings and queens of L.A.’s cocktail culture will donate their time plus bar tabs from their home bars for pre-paid drinking dates. Already, you’re intrigued. And to sweeten the deal, there’s also a Jenga tournament, bottomless punch, bar bites, and music by Hobo Jazz. Ms. Go Go knows she had you at Jenga tournament.